If you’ve visited this site before, you know that about a week and a half ago Valve sent out Vive headsets to attendees of the Vision Summit. Since then, I’ve been hacking away to make some demos & tutorials for all of you. In that process, I came across a prototype that appeared to be a lot of fun, so I polished it up and turned it into a real game. If you happen to have a Vive Pre and want to try it out now, send me an email using the Contact/Question form below. 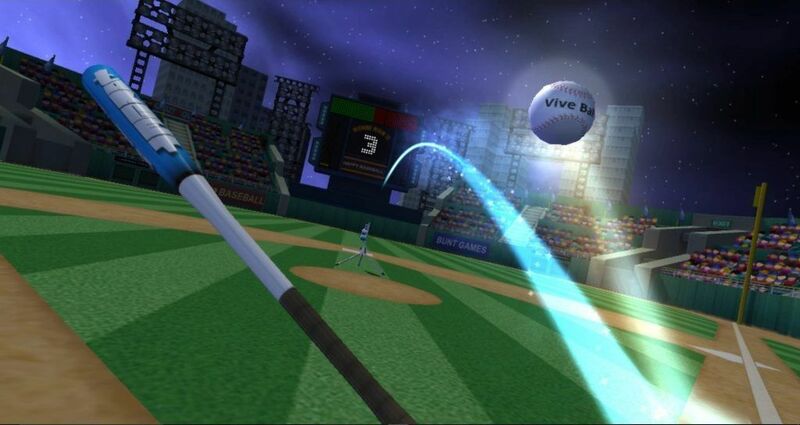 Vive Baseball – Home Run Derby is an exciting active baseball simulator for the Vive. Challenge your friends and family to see who can get the most home runs before the timer runs out. There are 3 difficulty levels, from easy (for chickens) to pro. Do well and the crowd will cheer. Try to bunt and get booed out of the stadium! There are a variety of bats to choose from, both wooden and aluminum. You can play at night, during the day, or even on another planet! It’s a lot of fun, and can be a great workout as well. Grab it now and see how many Home Runs you can hit!